Step 2 While the rice is cooking, heat a skillet or wok over medium heat until hot. Add the oil, and when it is hot, add the garlic and stir-fry until it begins to color. Add the ground pork and one-quarter teaspoon salt and stir until the pork is cooked through, 3 to 4 minutes. Remove from heat, place in a bowl and set aside. Step 3Place the garnishes (roasted peanuts, chopped chiles, chopped green onion, cilantro and pickled vegetables) in small bowls or in separate piles on a platter. Step 4Just before serving, stir the cooked rice gently. If you find the congee too thick, add boiling water one-half cup at a time to achieve the desired consistency. Transfer to a serving bowl. Ladle the hot congee into individual soup bowls at the table. Step 5Place the bowl of sauteed pork and garlic on the table, along with a small bowl of soy sauce, salt and pepper, and the platter or bowls of other accompaniments so that the guests can help themselves as they please. In Recipes-list.com we have selected the most viewed recipes from category - Breakfasts Main courses Soups . Enjoy the best recipes specially selected for you! 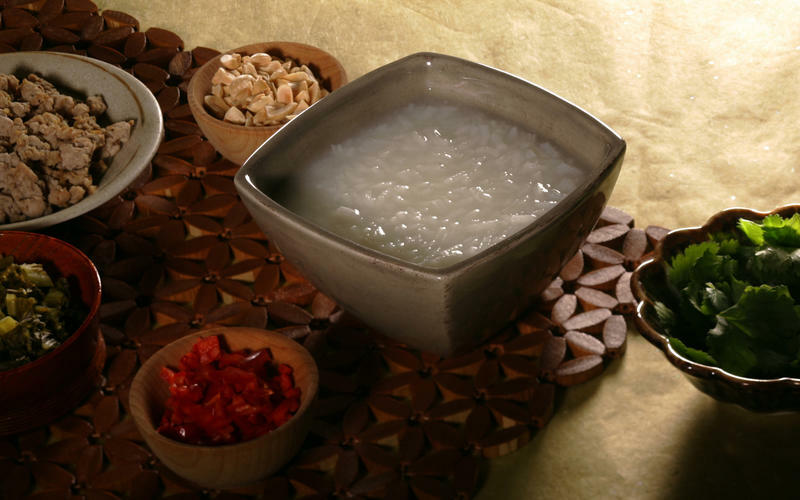 Basic rice congee is the right choice that will satisfy all your claims.